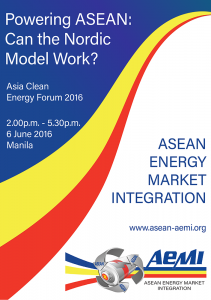 The AEMI Initiative will conduct a Deep Dive Workshop (DDW) during the ASEAN Clean Energy Forum (ACEF 2016) hosted by the Asian Development Bank (ADB) 6-10 June in Manila. The Workshop, held on 6 June, 2.00 – 5.30 p.m., is entitled Powering ASEAN: Can the Nordic Model Work?. Furthermore, the AEMI Initiative will hold a Knowledge Sharing event Can Nord Pool be a Model for an ASEAN Electricity Exchange? on 8 June 2016, 4.0-5.30 p.m.
ACEF is the premier knowledge-sharing event for staying current with the latest developments and key issues in Asia’s clean energy sector. Each June, clean energy professionals convene at ADB Headquarters to network, discuss issues, exchange knowledge and do business. Some 1,500 energy experts and participants from Asia and beyond attended the event in 2015. In 2016, ACEF will be celebrating its 11th anniversary, and expects attendees from around the world. The ASEAN Studies Center, Chulalongkorn University, is one of the Partners of ACEF 2016. A flagship of past ASEAN energy cooperation agreements has been the ASEAN Power Grid (APG), designed to establish connectivity and deliver energy security throughout ASEAN. Much progress has been accomplished, with planned APG infrastructure successfully deployed, and several bilateral connections operating. The challenge however is for APG inter-connections to operate on a multilateral basis, and to deliver electricity throughout ASEAN. The success of such approach would enhance energy security, expand access to electricity, improve deployment of renewable energy, and optimize the use of clean energy sources throughout the ASEAN Economic Community. The AEMI Initiative participation to these two events during AECF 2016 provide an opportunity to describe the APG, discuss its rationale, identify its potential benefits, outline its current challenges, and most importantly, brainstorm in an interactive manner on whether the Nordic electricity exchange model could be adapted to ASEAN. This would provide the framework for the APG to function on a multilateral basis, and unleash the benefits it carries for all ASEAN Member Sates.